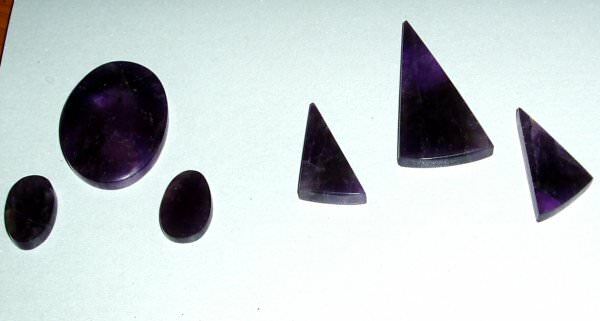 Over the last couple of days I have been cutting and polishing two Amethyst cabochon sets, one is triangular with a curved bottom and the other is a more traditional oval shape. 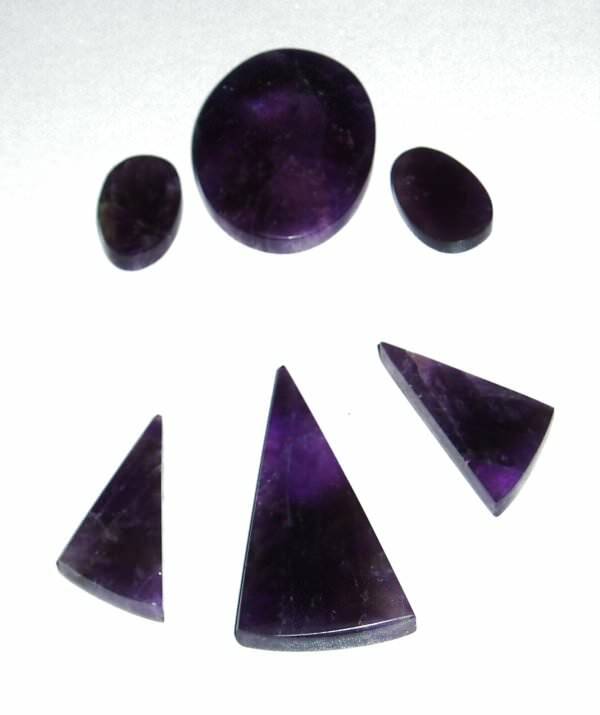 These were cut from the darker parts of a couple of lumps of Chevron Amethyst, I find these pieces of chevron tend to give a richer purple, you just have to think about how you are going to cut them before going to the saw and also keep in mind how many small slabs you want to get out of one lump. Also by cutting sets from one lump of chevron you tend to get good matching shades of purple, if you cut from different lumps you run the risks of not getting consistent shades of purple. I did have a problem with the larger triangle cab, after I had cut it I put on the 80 grit diamond wheel to shape it, but when the eater dried off it I found it had a fractures right across the bottom which when light finger pressure was applied it snapped along the fracture line. This is a good point to keep in mind, beware of any fracture lines, if you find any see if you can break it with your fingers, it’s better it breaks now than further down the line when you are polishing or worse still after you have sold it! I selected another lump of chevron Amethyst and cut 3 new cabs, fortunately none of these had fractures and they have all now been through the shaping, sanding and polishing process. One thing you will notice with this Amethyst is that it does have some pitting and try as you might to get rid of these pits you will have one or two small ones, you see the problem is that as you get rid of one pit you reveal another so in the end you end up with a very thin cab that’s still has some pits. Next step now is to wrap these in gold filled wire as per our client’s requests, once they are done we will post some more pics.